Last night, just when we were trying to get our heads around Facebook‘s data collecting program, TechCrunch reported that Google also had an app that monitored users’ activities on an iPhone and rewarded them. 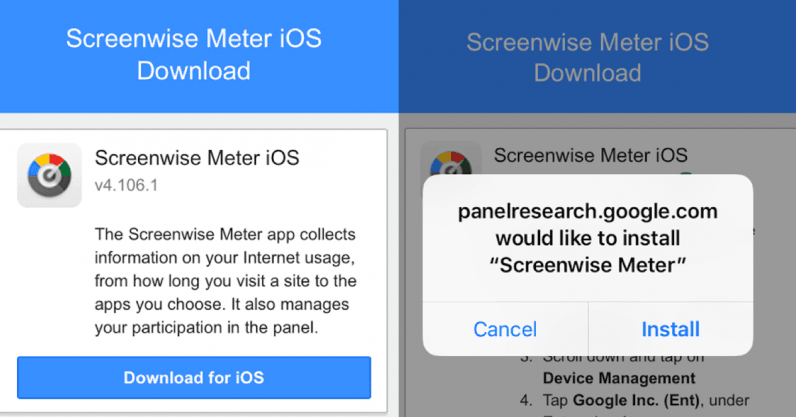 The Screenwise Meter app, launched in 2012, had a similar installation process to the Facebook Research app that’s now been shut down. It invited users aged 18 and above (or 13 and above in a family group), to install the app and the enterprise trust certificate in order to monitor users’ activities on their mobile devices. While Google’s program was more upfront and gave all the details about how it collected data, it undeniably violated Apple’s enterprise certificate rules and collected user data. Companies that rely extensively on users’ data to run their businesses must re-evaluate old apps and services they initiated in an era where privacy rules were not as stringent as they are today – and avoid operating such programs in the future.